One of the memorable characters from the old days of television was Eddie Haskell of "Leave It to Beaver." President Trump no doubt remembers him. Haskell was sycophantically respectful toward parents to their faces but always plotted and schemed when their backs were turned. To a generation, Haskell symbolized hypocrisy of the most annoying kind. 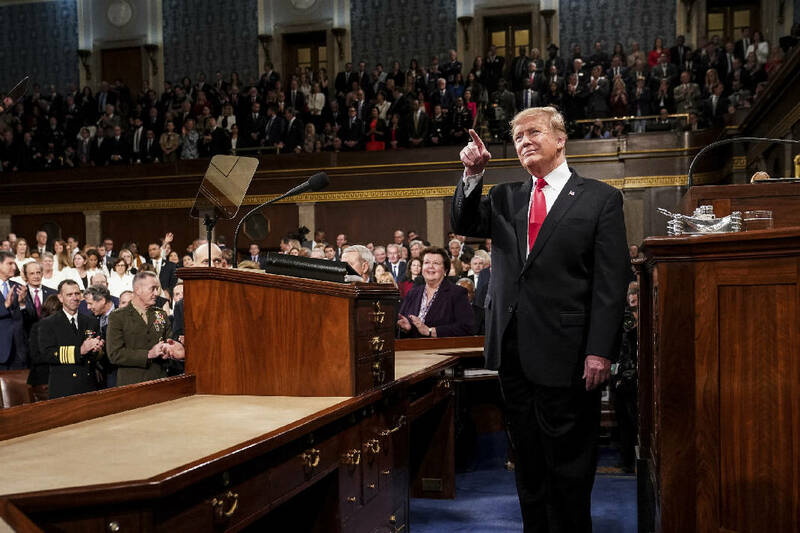 Trump's address Tuesday was the Eddie Haskell State of the Union — although Haskell's performances were more artful, because he turned nasty only when the elders weren't looking. In Trump's case, his two-faced politics was on display in the very same oration that went on and on and on. At the outset, Trump tried his mightiest to be a bipartisan unifier in the manner of President Dwight D. Eisenhower. "We can bridge old divisions, heal old wounds, build new coalitions, forge new solutions and unlock the extraordinary promise of America's future. The decision is ours to make." For one thing, he could not even refer to his opposition by the name they choose for themselves. He insisted on referring to the Democratic agenda as a "Democrat agenda" — the most tired of McCarthy-era rhetorical tricks. And a large part of his speech, especially the replay of his Chamber-of-Horrors bombast on immigration, was nothing but partisanship. The usual cast was there, the "ruthless coyotes" — Lord, he loves referencing those coyotes — the "cartels, drug dealers and human traffickers," and, of course, the "caravans." He offered not a single nod to the traditional value of not separating children from their parents when they arrive at our borders. All this was in the service of his main warning: "An economic miracle is taking place in the United States, and the only thing that can stop it are foolish wars, politics or ridiculous partisan investigations. If there is going to be peace and legislation, there cannot be war and investigation." Abrams said what she meant and did not pretend we were about to enter a fantasyland of miraculously dissolving party differences. Rat-a-tat-tat, she catalogued the issues her party wanted to bring to the fore: the foolishness of Trump's shutdown, gun safety, student loans, voting rights, the GOP's reactionary tax bill, farmers caught in a trade war, protecting the Affordable Care Act, climate change, LGBTQ rights. There was also this on-target reply to Trump's canard that all who oppose his immigration policies favor "open borders." Abrams's answer: "Compassionate treatment at the border is not the same as open borders." But Abrams's most powerful contribution to her party's discourse may have been her open invocation of religious commitment and the virtues it can promote. "These were our family values," she said of her Methodist home, "faith, service, education and responsibility."